For October, Baby Loss Awareness Month, we are taking part in Aching Arms UK #MilesInMemory. 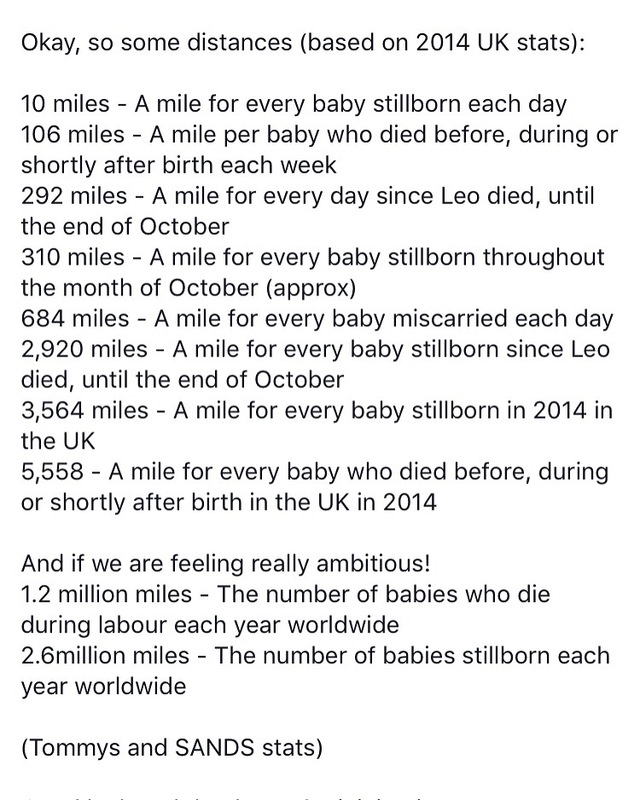 We have a team involved (feel free to join) but me and The Wife have decided to try and clock up 310 miles, which statistically is a mile for every baby stillborn through the month of October. This is going to be quite a challenge, but a worthy one. On my walk this morning I was considering ways to motivate us. I’d like to dedicate each mile to a baby that should still be here, whether they have left us through #miscarriage, #stillbirth, #neonataldeath, #babyloss, #infantloss or #childloss or for any reason. So I started making a list. I hoped that I didn’t know 310. I’ve got to 92 so far. If you’d like me to dedicate a mile to your baby or babies, could you drop me a comment below with their names, dates and anything else you’d like to share perhaps? I’d really like to be able to honour all forms of loss in this event, raise awareness and have those names written and shared with the world. I plan on taking the names with me on any walks or cycles we do. I’d like to take a picture of the names on the walk, and share them on my blog. It’s only something little, but these statistics need names, dates, stories and families to them – people need to understand the enormity of this. Thank you for considering this little ‘project’ of mine. If you’d like to join Team Leo or take part in the event in your baby’s name – drop me a message and I’ll send the information for you or look up @achingarmsuk. First of all I am so sorry for the loss of your precious Leo and little Robin. But, this is amazing!! Thank you for giving other mothers a way to honor their babies through something so selfless. I would love for you to carry my daughter, Aria, with you on your journey. She was born on February 9, 2016 and passed on April 19, 2016, to reasons still unknown. Again, this is amazing and thank you for giving me this opportunity. This is a beautiful tribute to Leo and Robin, and a lovely idea to remember other precious babies. I would love you to include my son Jovan. He was born on 14th July 2016, far too early to survive, but loved every second of his short life and will live forever in my heart. This is seriously amazing and what a beautiful way to remember your sweet Leo and Robin! I would be honored for you to carry my daughter Averie. She was born Feb 12, 2015 and died just 12 hours later because of trauma during her birth .